Nevada is a sacrifice zone, a necrosis caused by greed. From edge to edge, the cancer of gambling and its associated ills dominates the landscape. Why not bury our nuclear waste here? 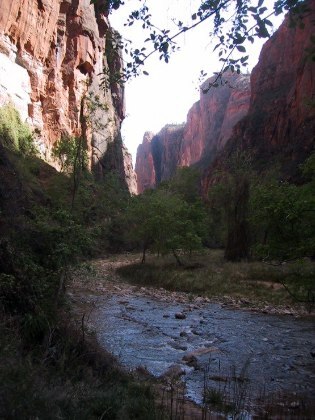 Geologically -- a word we found ourselves understanding better than ever -- Zion Canyon is a drain to a large basin. 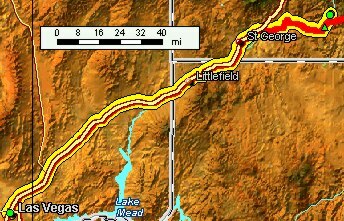 The Paiutes, its original inhabitants, called it "The Wet Place." Because it's on the edge of the Plateau, it is home and meeting ground for species from several different ecological regimens -- low desert, cliff, high desert -- and so the diversity of life here is remarkable. Cross the imaginary line into Utah, and the scene changes dramatically, unexpectedly. We found ourselves breathing more easily, and enjoying passing by the rocky treeless mountains, dry washes, the occasional green evidence of a pocket of moisture. Soon, the outer rim of the Colorado Plateau, a huge primeval uplift that added a thousand feet of altitude to a Colorado-sized chunk of the Four Corners area, made its contribution to our progress. Amazing what a little slope and erosion will do to a desert! 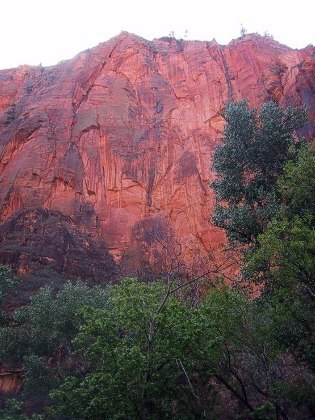 From the "Temple of Sinawava" an easy path called River Walk continues along the Virgin River at the base of 2,000 foot high cliffs. Beside the walk, the cottonwoods give way to swampy, shadowed space where a riot of ferns and other water-hungry plants thrive. 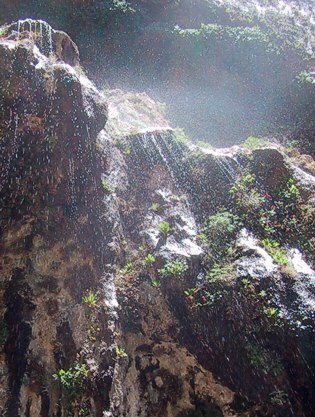 Heading back toward the light and the tram, the hanging gardens that adorn the vertical cliffs were backlighted. Like Boulder Dam, I thought, this place is really too grand for photography. The contrasts between light and shadow and between the immense and the tiny are almost too much for that ever-so-much more faithful instrument, the human eye. 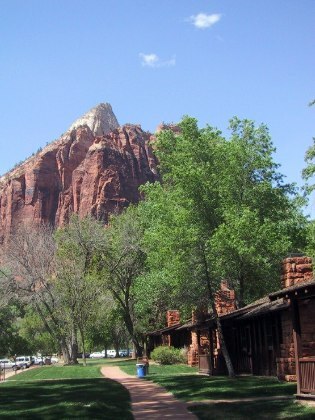 We trammed back to our simple but lovely accommodations at Zion Canyon Lodge, enjoyed our dinners, and went to bed in the blessed silence of the canyon, looking forward to another two days of explorations. 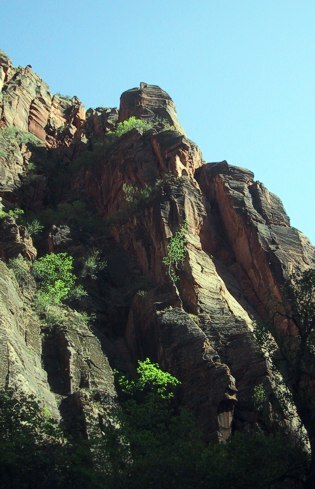 The ninth most-visited National Park, and with 2.5 million tourists annually congregating in a canyon ten miles long and less than a mile wide, Zion instituted a no-cars policy in 2000, and the effects have been splendid. Visitors take propane-fueled trams from viewpoint to viewpoint, and so we promptly boarded the tram and went as far up-canyon as we could go. 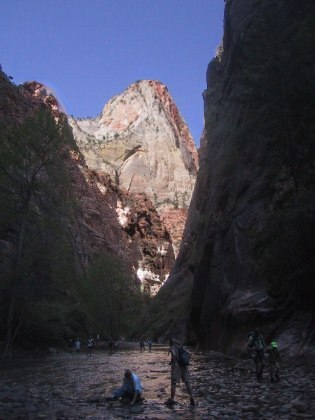 At the end of River Walk, the cliffs pinch in, so hikers take to the river to continue on into the Narrows -- being unprepared for this, we sat on a big rock and watched a steady stream of them return. Bring good shoes with ankle support and good gripping tred you don't mind getting wet, and a stout stick for balance on the slippery rocks, they told us. 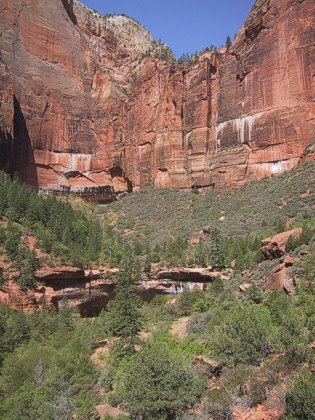 Zion's features, in addition to being fancifully named, are amazingly accessible, and along the trail we met families, foreigners, old, and young explorers, all sharing the awed breath of human smallness in the face of Nature's grandeur and attention to detail. Apart from people, lizards -- elusive little buggers! 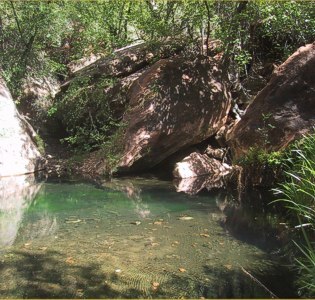 -- were the most numerous residents, not counting the diverse flora of the skree slopes and sandstone ledges: cactus in bloom, oak, juniper, and piñon pine punctuated by seeps and streamlets and their characteristic vegetation. Even with the perennial dripping, this area is affected by the three- or four-year drought (opinions differ) that afflicts the whole desert southwest. "It's a poor year for wildflowers," we were told, and the brownish margins of the fern showed this to be too true. On the valley floor, only the careful exclusion of millions of walking feet by the rangers has prevented desertification in the fragile grasslands where we saw wild turkey, deer, and the evidence of porcupines and ring-tailed cats. The next morning, we headed right across the Lodge's wide spot -- good idea to build away from these ever-widening canyon walls -- and into a semicircular side canyon where the interplay of rock, slope, and water has created a series of year-around pools that attract and foster abundance of vegetation and wildlife. 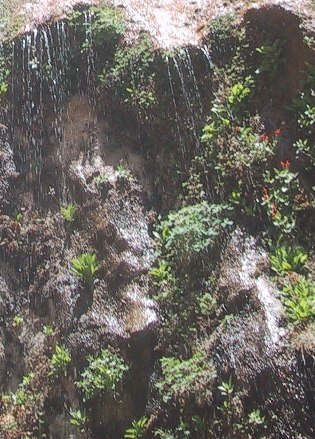 Later in the day we trammed and clambered up a steep, short trail to Weeping Rock, a prolific spring line at the base of the Navajo formation that supports a jungle of these same water-loving plant species. Here, the softer sandstone that underlies the Navajo has been washed away, leaving a shady cave behind the dripping wall of water. 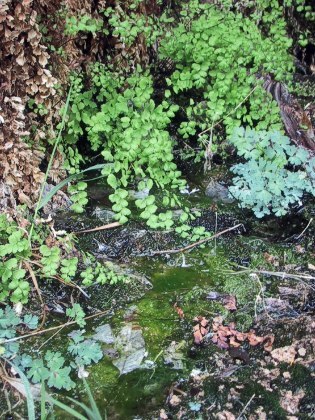 Below, another emerald pool; to the south, a riotous wall-garden of competing ferns and flowers, including golden colombine, red shooting star, putting on a springtime show. 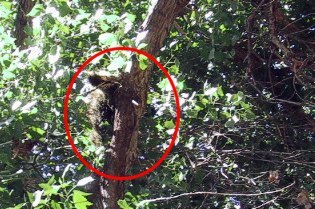 All day long we watched a porcupine sprawl comfortably in various shady forks and crotches of an old cottonwood near our cabin, while we eyed the pinnacle known as Angel's Landing just up-canyon from the lodge. With binoculars, we could see people up there. Our personable waitress assured us we could make the climb if we took it slowly. 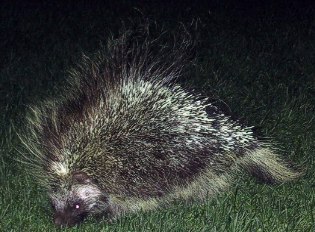 We valiantly tried to talk ourselves out of it, but by nightfall, with the porcupine foraging on the lawn in front of our cabin, it seemed certain that we would at least make the attempt ...and that's the next page!